Credit to Brad L. Bettenhausen of Tinley Park, Illinois for sending in this material. Inside Bremen township, south of 135th street and secluded in some woods north of Midlothian, there is an old burial ground known as Bachelors Grove cemetery. This tiny and isolated graveyard is, or at least it should be, one of Illinois' important historical sites. But the question of whether or not the site will ever be recognized as an official state historical monument has been given to the public jury, and the jury's verdict may come in too late to do any good. Bachelors grove cemetery dates back to the pre-civil war era, but because of the ravages of nature and especially of people, it has been slowly deteriorating. The slow process of nature have been working for more than 80 years, but the major part of the cemetery's downfall has taken place in the last 15 years. Major disaster has been brought about by men. 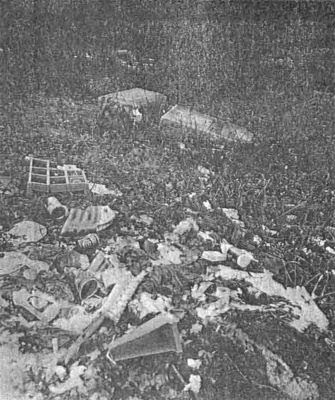 BECAUSE OF IT, the cemetery has been transformed into a dumping ground, suitable only for "night spot activities." However, Congressman Edward J. Derwinski, state Senator-elect Don Moore, local civic and historic groups, and the ancient Bachelors Grove Trustees association have been laboring together to save and preserve the old cemetery. According to Moore, the cemetery is one of the country's oldest privately owned cemeteries. It may be the oldest of all in Illinois. 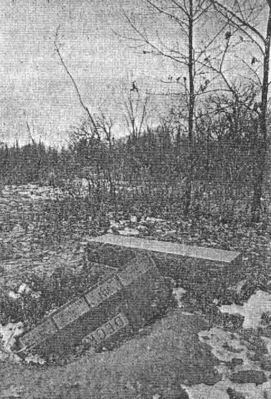 Although there are others affiliated with churches that are older, Bachelors Grove ranks as one of the oldest privately-owned graveyards in the United States, Moore believes. Preserved bookkeeping records kept by the cemetery's board of director date back only to March 11 1860. There is a latter notation of a common business transaction involving the building of 54 rods of fence around the grounds. Also recorded in this same entry are the names of the members to stand out more than the other 24 is that of William Hamilton, believed to be mortally wounded during the Civil War and laid to rest in Bachelors grove. Hamilton's death in combat, and his burial in the cemetery, are reasons enough for the cemetery to be recognized and set aside as a state historical site, head interests believe. BUT THE cemetery hasn't received any state recognition because of a legal technicality. there is no record of any official dedication, which would have made the burial grounds an official legal cemetery. Proof that there is a Bachelors Grove is that there has been a cemetery board of directors for at least 112 years, there is an arrangement of graves and headstones and clearly many, many persons have been buried there. But apparently all that doesn't matter. Legally, there is no Bachelors Grove cemetery. In trying to get aid for the site on a state basis, Moore has been faced with the legal dilemma so many times that he now says with irony, "Yes, I know there is no Bachelors Grove cemetery. But next time you visit Bremen township I'll show it to you." Although no one knows the exact age of the "non-existent" graveyard, many familiar with it remember seeing a pair of stones in the Grove with burial dates of 1828, sitting in a corner of the lot side by side. SOME OLD-timers can also remember a lonely curved-shaped stone with a burial date of 1832 inscribed on it. The names on these stones were obliterated, and the records kept by the trustees list only business transactions, assets, and assessments. They provide no clue as to the identity or history of the persons buried. An extensive, long-term search is under way to recover the now gone stones, or to find an old photograph that may add more substance to the old-timers memories. The most discouraging problem facing the cemetery's future, though, is vandalism. Despite extensive patrolling, vandals frequently sneak in and deliberately ruin the site, apparently "just for kicks." At one time a fence was erected across the cemetery's entrance road that could be opened only with a proper key. This fence successfully deterred most of the vandals, but it had to be removed because many relatives of the buried not living in the region did not have keys and could not get into the grounds. Two active members of the trustees, Clarence Fulton of Tinley Park and Mrs. Dorothy Anderson of Midlothian, have many fond memories of Sunday visits to the cemetery. AS YOUNGSTERS they looked forward to picnics during the pleasant summer months. At that time the site was considered a park area, with the little nearby stone quarry pond providing recreation as a swimming and fishing hole. The creek that runs into the pond offered an opportunity for wading, chasing frogs, and general all-around horseplay. The natural beauty of the setting made this small plot of land one of the most respected and enjoyed spots for miles around. Rose and lilac bushes, pine trees, violets, and thousands of tiger lilies still abound. One can only imagine the splendor these grounds once held. But now the splendor has been replaced by a scene of strewn empty beer cans, holes that have been dug in a wild attempt to find coffins, headstones desecrated and marked up. Stones have been stolen and vandalism of every form has been destroying the grounds at an accelerating pace. The exact age of the graveyard may never be discovered, but it had to be before March 27, 1848. A stone bearing that date can still be found, and this stone predates all cemetery records. AN INTERESTING note is that the alleged 1832 burial date predates private ownership of the land. Records show that in June of 1835, a Corintha Everdon obtained the land from a U.S. patent. This could indicate that she and some relatives had moved there earlier, and lived there possibly as squatters. Maybe after a family death occurred, the idea of permanent residence was accepted. Since the 1820's were economically very rugged times, it is seriously doubted that a single woman could make it on her own in such hard times. Possibly she moved to the area with a large family of cousins, aunts, uncles, nephews, and other relatives. This theory is borne out by the repeated recorded land transactions between Samuel, Edward and Corintha Everdon. If so, it is possible that two family deaths occurred in 1838, the year old-timers remember seeing on the side-by-side headstones. Evidently there had been enough family deaths by 1964 that when Edward Everdon sold his land to Fredrick Schmidt, he made a notation deeding all his land to Schmidt "except one acre to be used for a graveyard." THE 1832 DATE, if proved and accepted, would bear out Moore's contention that the graveyard is one of the oldest privately owned cemeteries in the state, or the country for that matter. Possibly, in the next few years with public support, the state legislature will abandon its stand that the grounds are "non-existent," and will aid the many organizations that have been fighting to preserve the pioneer cemetery before it is destroyed beyond repair. But at the present rate of disintegration, it may be that the cemetery won't be there when action is finally taken. The verdict is in the hands of the public jury.